Tenia Nelson from Jazzy Paper Designs and I have a card to show y'all and it goes a lil somethin' like this.....CHECK IT!! 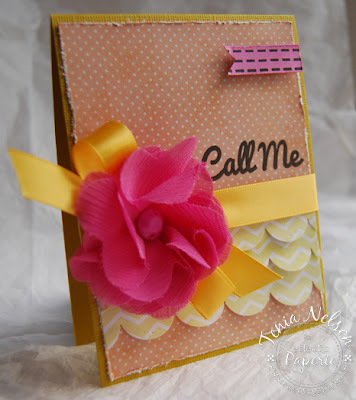 I created this card using papers from the Tangerine Line by My Minds Eye, Vintage Gauze Blossoms-Pink by Maya Road and I used the Great Big Greetings set by Market Street Stamps. I thought that I challenge myself a bit and create something that was a little Shabby Chic.....I hope I did it....lol!!! Thanks for stopping by and have a great day!!! oh love the "ruffles"..... great idea!